So once again it’s all changed for me. I have finally set myself free of a big corporate organisation, taken the big leap and set up a PR agency with a long time colleague. It’s been a long process and it’s been so strange going through it all without being able to write about it here. We’ve been officially launched for just a few weeks but we were unofficially started as soon as I left my previous job at the end of June. 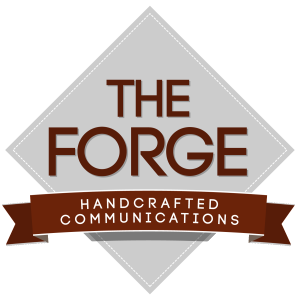 You can read about the launch of The Forge in this article in our trade rag. I can’t quite put into words how it feels. But I was talking to my business partner Emma-Jo about it this morning, trying to put my finger on why it’s so much better for me and I decided it’s all about freedom. The only people I’m answerable to are my clients, which is how it should be in PR. We are about serving our clients. As a small business the politics are non-existent. We work around our clients and our own lives. I can take my children to school every day if I want, as long as I’m not at a meeting early. I can manage my own time so much more effectively without a big commute to London and a draconian 9-5.30 regime. We have just hired our first full time member of staff, which is very exciting. She joins in a couple of weeks so Emma-Jo and I are now becoming IT experts (well we’re going to the Apple store to buy her a mac) and facilities managers (finding another desk). I think one of the most stimulating and exciting things about starting up a business is the amount that you learn. I was an MD for 6 years but I don’t think I ever really appreciated how to run a business properly until now. Each and every decision is a big one for us. From what we charge and which office to take, to the ever so slightly more mundane question about what size white boards to have and do we really need paperclips in our office? Of course what we both really enjoy is meeting new clients, pitching for new business and coming up with the plans. Which is a good thing, because we’re very busy. My girls have noticed a change I think. They are still crazy and completely extraordinary, they make me laugh, they make me cry, but I get to see so much more of them. I’m not missing so much, the little things, the school drop off, the chat at supper time about which friend did what to who and how many planets there are in the solar system. Tilly reading to me most evenings because I’m back early enough to listen, helping them both with endless Christmas lists (Father Christmas is going to be busy this year). It’s stressful but it’s true what they say, it is a different type of stress and the motivation is so much greater when it’s for yourself. You can visit our new website here.